Diversity is a topic rarely out of the news, from the lack of women on company boards to youth unemployment. However existing "Diversity 101" policies are seen as tired and ineffective. 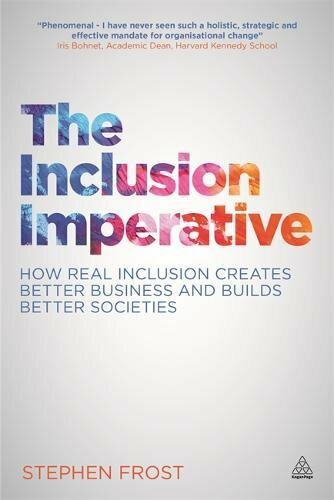 The Inclusion Imperative is a useful guide for professionals wishing to develop a genuinely diverse workforce and an inclusive workplace, but who are frustrated at the inadequacy of guidance currently available to them. Through practical advice and case studies, this book helps organizations deliver improved employee recruitment and retention, enhanced productivity and better decision-making. Leadership, diversity and communications expert Stephen Frost demonstrates that inclusion is not just a moral imperative but one that brings economic and other intangible benefits to organizations. This book was forged in the unique atmosphere during the planning, organization and implementation of the Olympic and Paralympic Games and includes practical advice and case studies that are valuable to organizations and businesses around the world.